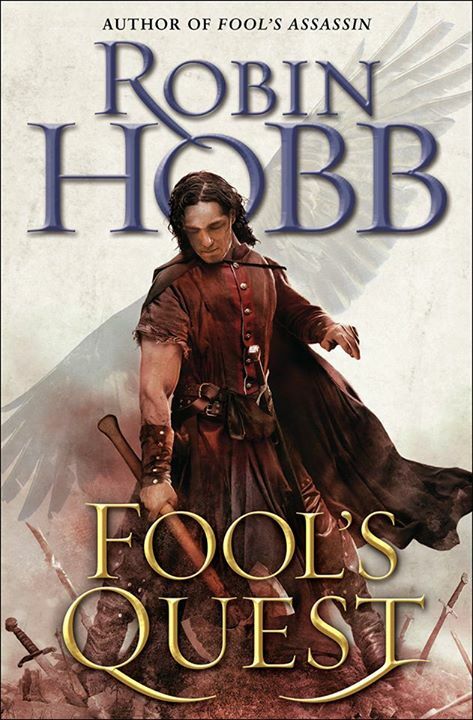 Most fans agreed that Robin Hobb’s return to Fitz and the Fool in last year’s Fool’s Assassin was a roaring success. Fool’s Quest is the second volume in the trilogy, and it tentatively scheduled for release in August 2015. This cover is a fantasy book cover. It looks a lot like the last cover, also by Alejandro Colucci. Fitz has an axe, which is good, and he continues to look older and more grizzled (as Hobb points out in her blog post announcing the new cover!) I like that Del Rey has created a natural progression in the artwork that starts off looking somewhat like YA, before traipsing into full-blown moody Fitzdom. Seems suitable, if you’ve read the books. Standing atop a pile of broken weapons, the detritus of war, is very similar to the covers that appear on Mark Lawrence’s Broken Empire Trilogy, so it’s interesting to consider the difference in posture and emotion of the two main characters. Cocky and victorious Jorg Ancartch, and brooding, sorrowful FitzChivaly Farseer. It’s an interesting contrast, though likely unintentional. This isn’t really how I imagine Fitz in my head, and I don’t think it’s fantastic cover art either — what does it really say about Fool’s Quest as a book? Plus, what is the deal with the wings behind Fitz — does this imply that someone in Fool’s Quest will Wit-bond with a bird of some kind? However, I have to say that I really enjoyed Fool’s Assassin and am looking forward greatly to Fool’s Quest. Robin Hobb is back on form, in my opinion. I love the books and the artwork. Hate the cliff hanger with Bee. The only comment I have is that Bee seems to be a main character, so I wonder why she is not included with Fitz? Of course I haven’t any idea where Robin takes her story but I would like to see her included.